L to R: Water Protectors Amos Cloud, Lin Bardwell and Nancy Gallardo sit around the fire at Camp Anishinaabek. 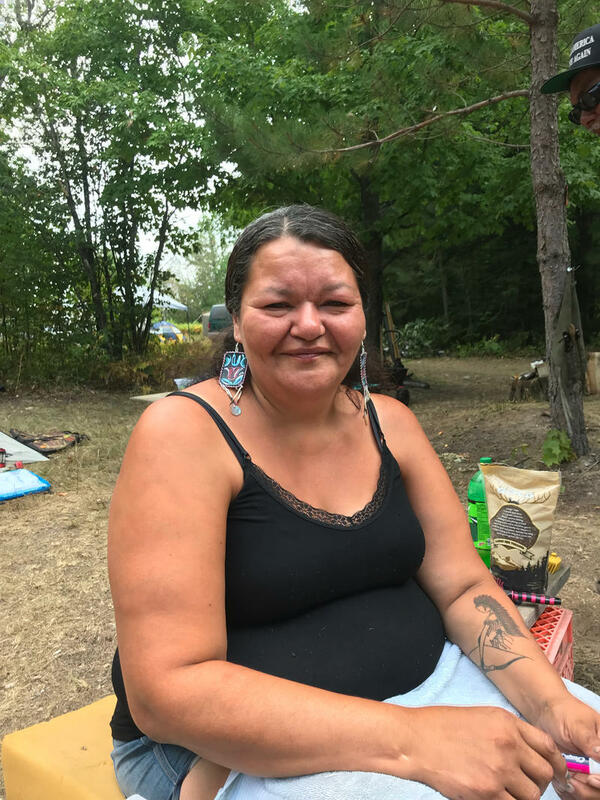 Christina Keshick of the Saginaw Chippewa Indian Tribe owns the Camp Anishinaabek property with her husband. The sacred fire pit at Camp Anishinaabek is for burning medicines, praying, and having meetings and talking circles. The fire will be lit in a few days and will be kept burning as long as the camp is operational. 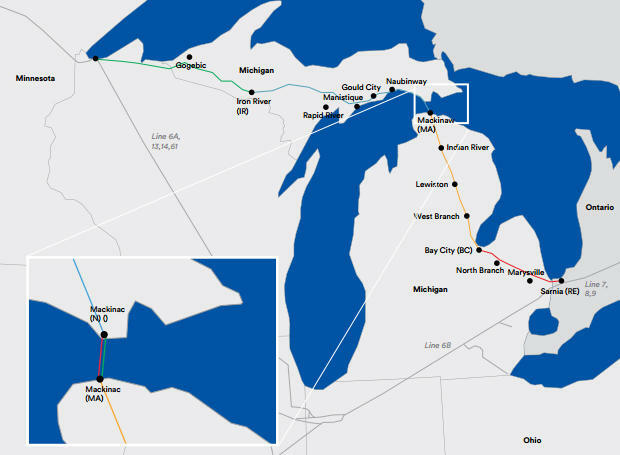 About 15 permanent campers are at two rural properties in Levering and Cross Village, roughly 15 miles south of the Straits of Mackinac, where twin pipelines along the lake bottom carry mostly oil on its journey from Western Canada to Sarnia, Ontario. Led by members of Indigenous Nations from around the Great Lakes, many of the campers were at Standing Rock in 2016. They're worried about an oil spill in the Straits of Mackinac, the connecting waterway between Lakes Michigan and Huron. They say they're not leaving the camp until Line 5 is shut down. They've named their camp "Camp Anishinaabek" (Anishinaabe is a broader name for a group that includes Ojibwe, Odawa and Potawatomi peoples, among others). Between telling jokes and sharing stories around the fire, the Water Protectors are stocking up on provisions and preparing for the winter. They say they are expecting many more people to join from around the region and beyond. James Pitawanakwat is a member of the Wikwemkoong Unceded Territory First Nation, on Manitoulin Island in Lake Huron. He and his wife, Christina Keshick of the Saginaw Chippewa Indian Tribe, own the camp properties. Pitawanakwat says he and his fellow Water Protectors are committed to remaining peaceful. "We have no plans of being militant," he says. "This is a prayer camp, a peace camp, and we want people to feel safe, especially if they're defending the water." In addition to the permanent campers, visitors come and go, bringing supplies or other campers. Lin Bardwell is a member of the Little Traverse Bay Bands of Odawa Indians, but she lives just outside of Grand Rapids. She came up for the weekend to give somebody a ride, and she plans to keep visiting. "This water system is very valuable to everybody in the area, so I really want to do everything I can to support the people that have made the sacrifice to stay here," she says. "Enbridge recognizes the rights of people to express their views legally and peacefully, and to discuss Enbridge's business and projects. We encourage active discussions on our operations and projects, as long as everyone is respectful of those who live and work near our pipelines, including our employees and contractors, and of our pipelines and facilities. 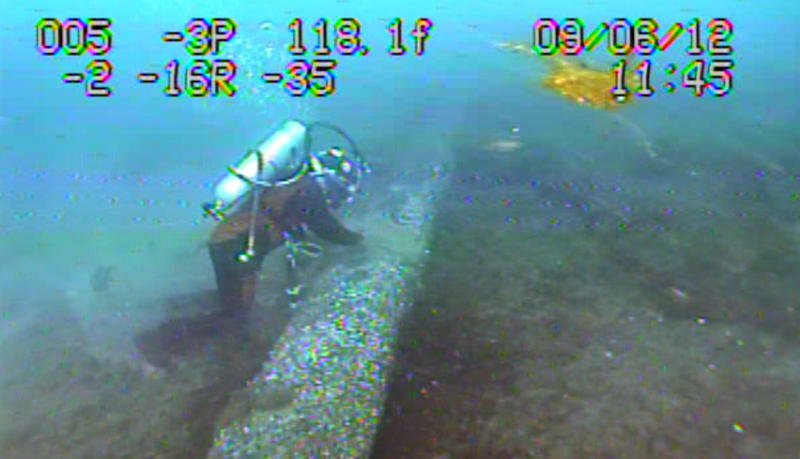 Enbridge will continue to engage in conversations with individuals and communities on our commitment to protect the Straits and Great Lakes while safely meeting Michigan’s energy needs." In full disclosure, Enbridge is one of Michigan Radio's many financial supporters.